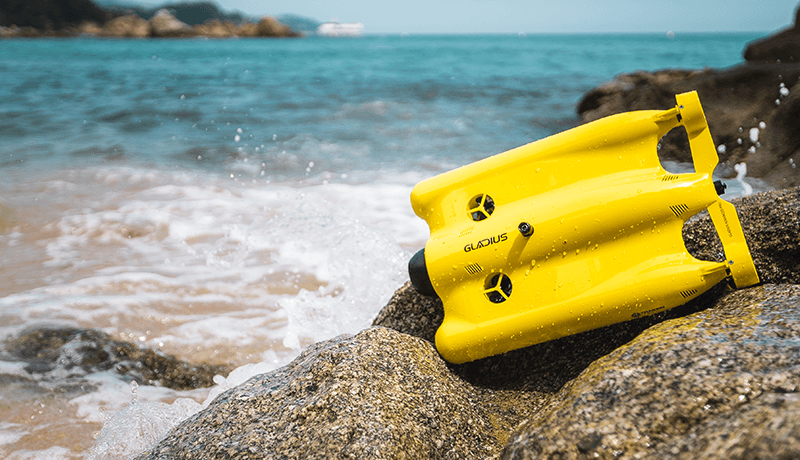 The GLADIUS is a smart underwater drone built for filming, observing and exploring. It is a portable and user friendly device that is able to dive up to a depth of 100 meters, allowing you to capture Ultra HD 1080P/4K quality photo and video directly to internal storage or live stream your dive in real-time. The GLADIUS is an excellent tool for scuba diving, underwater photography, sea fishing or yacht entertainment. GLADIUS can easily dive to 100 meters or 330 ft, The towable floating buoy integrate wireless WIFI module. This gives GLADIUS a maximum 100 meters or 330 ft safe operating range. The built-in Ultra-HD camera and adjustable dimming LED lights on either side have been optimized for use in water, which enables users to take stunning 12 Mega pixel underwater photos and 4K videos. GLADIUS comes with a 49mm filter holder, users can install any 49mm filter in front of the camera to see true color of underwater. The unique Quattro-Thrusters design and auto-stable algorithm makes it able to nimbly and stably move in all directions at fastest speed of 4 knots. GLADIUS comes with replaceable Seawater/Freshwater Ballasts for use in fresh and sea water. Select the proper ballasts for any type of adventure. Take the backpack and start your underwater adventure. The game-like controller and the APP interface is quite simple and intuitive. Simply insert your iOS or Android smartphone into the remote control and start flying!